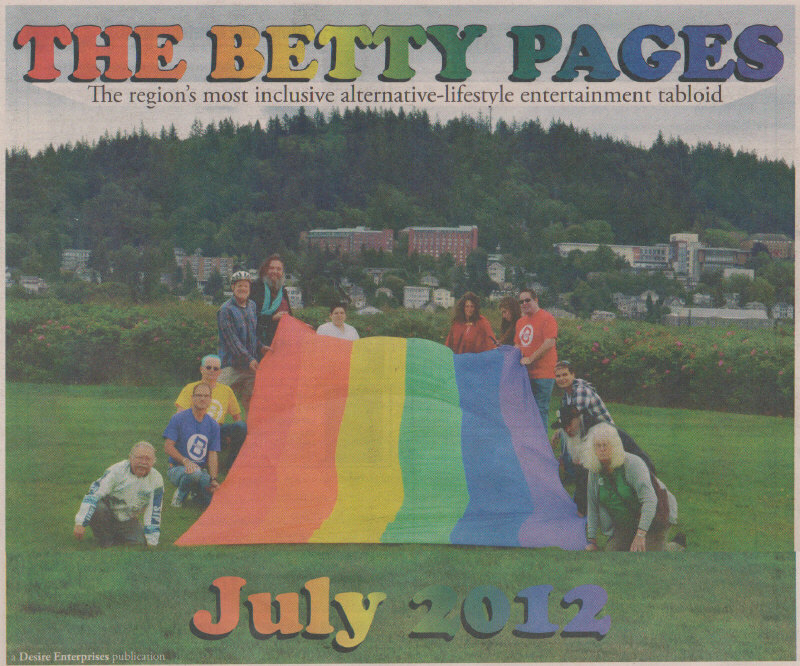 I made it to front page of Betty Pages again as part of a gathering holding the rainbow flag for a photo shoot. I'm with a bicycle helmet on the left. Picture makes Bellingham look quite green. Above the grass of Point Zuanich Park is Sehome Hill with 2 dorms of Western Washington University at center. Nash and Mathes dorms. It wouldn't look quite this green if picture was taken in Walmart parking lot. Haggrid hatched a good idea for the front page of Betty Desire's local tabloid. Why don't we pose with Betty under the sign that flashes "Pansies" at Garden Spot Nursery on Alabama Street? 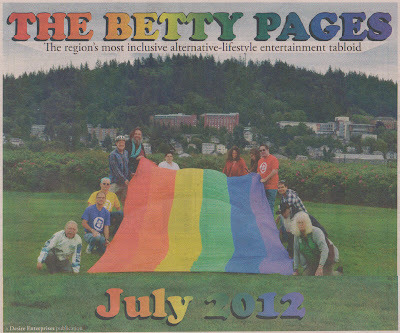 The Betty Pages is this region's most inclusive alternative-lifestyle and entertainment tabloid. It's published by a drag queen named Betty Desire who almost always poses as part of her front cover. 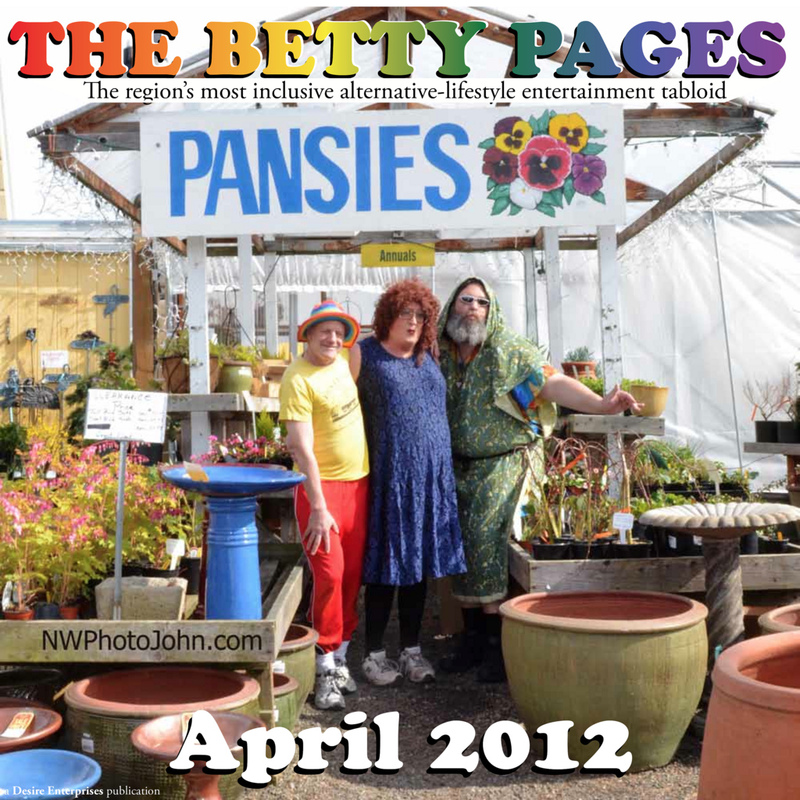 On Betty's left, this month, is Haggrid who came up with the idea for the shot while I'm on her right with my rainbow hat. Betty's in the middle. Photo by NWPhotojohn.com. The shot also promotes Bellingham's Radical Faerie organization that meets for coffee and conversation each Saturday at noon. I don't drink coffee, but there's plenty of chocolate milk for me. It meets at Public Market, a reinvented Safeway store near downtown Bellingham. Now that building is full of alternative businesses. Faerie Coffee meets near the Trapeze Kiosk which serves coffee, hot chocolate and other things. Trapeze Kiosk is run by Bellingham Circus Guild. It's spring and time to reinvent a lot of things.